Jerry Garcia played on "Oh Mommy"
The long list of musicians who have appeared on Brewer & Shipley albums is truly a Who's Who of musicians. Of all the contributions by those brilliant musicians, the one that seems to draw the most interest from fans, is the late Jerry Garcia's contribution to Brewer & Shipley's 1970 Tarkio album. and had a flat-top haircut, so we went back a ways with some of these people. Jerry had just started playing pedal steel guitar. He came in one day, and we were working on some stuff. 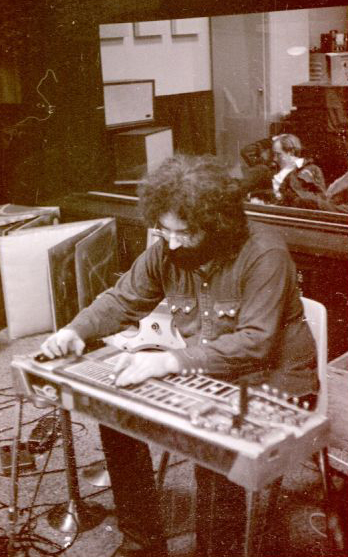 We said, 'Hey Jerry, we got a song here, would you like to play pedal steel?' And he said, 'Sure.' So he set up his pedal steel and played on a song called 'Oh Mommy' (I Ain't No Commie), the B-side to 'One Toke Over the Line.'"